Prague was always one of our “must visit” cities when we planned this trip. It got even more exciting when it was the place we decided to meet with some friends for a weekend. With the dates set, we had a few more days to explore the Czech Republic beforehand, and Brno was right in our path. Brno is the Czech Republic’s second city, and the capital of Moravia. 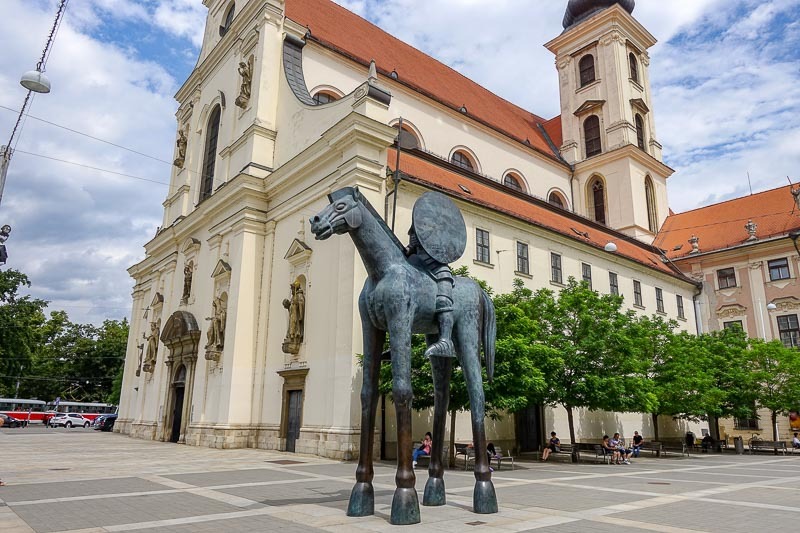 It has a friendly rivalry with Prague over, well, nearly everything, and is best known for the Brno MotoGP event that is held there each August. 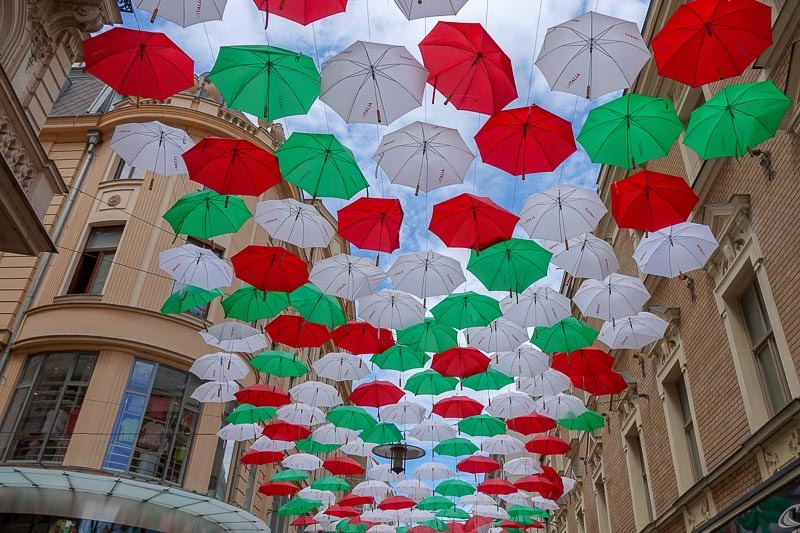 Brno has a population of around 400000 for most of the year, but it is a university city and during summer that number drops by about 90000 when the students all return to their home towns. It therefore has a young vibe, with plenty of cafes, clubs and activities. Before we got on the train to Brno I had researched how to get to our accomodation. During the train trip we discovered the train was taking a detour while the station was renovated. Oh no! We had no idea how to get where we needed to be. We also had no Czech Koruna, and there was not an ATM in sight at the temporary station. Our worry was needless. Asking around we found the right bus, and we could buy bus tickets at the station with credit card. The day we arrived was HOT! It was 36 degrees Celsius, which was fairly unusual for this part of the world. It was such a relief to walk into the Holiday Inn. Air-conditioning and a cold shower was the order of the day! Brno is one of the quirkiest places we have ever been to. If you visit here, make sure you take a walking tour. We took a free one with Brno Free Walking Tours. You need to have a guide here because there are so many little things you will miss if you do not have someone the point them out to you. One of the most well known attractions is on the old town hall. Before the building was completed there was a dispute over payment between the stonemason building it and the town statesmen who had commissioned him. As revenge, the stonemason built the middle pinnacle over the portal crooked. It is still that way today. Notice the middle spire is bent? Did the town learn from this? No. A similar dispute happened when statues were being built for the outside of the Dominican church. Again the stonemason was not paid what he wanted. This time it was the all powerful church upsetting the tradesman. If you look carefully at the statues along the side of the church, the signs of his displeasure are visible. One statue has a visibly small head. Another has six fingers. Yes, his head is unnaturally small! It almost seems like a trend now, because the quirks don’t end there. Look for the cheeky little boy above a window on St James church, or check out the horse statue outside of the Church of St Thomas from a particular perspective. If you wait long enough you will see others looking at it from underneath. Copy them to see what may or may not be an unintended sight! 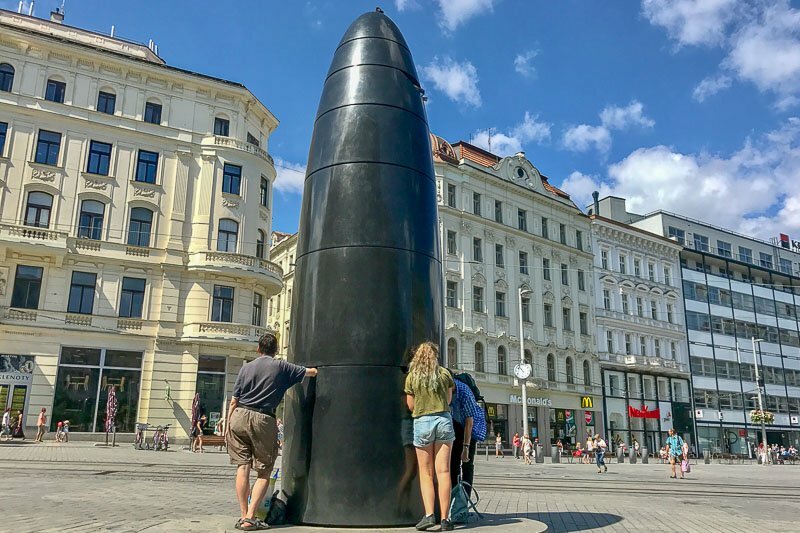 Then there is the bullet shaped astronomical clock in Náměstí Svobody, the main square of Brno. At 11am each day a special marble rolls down from the top of the clock and appears at one of four holes on the side. We arrived at the clock at about 10:30 to wait for the walking tour and already there was someone standing at each one of the holes, hoping that they would be the one to receive this unique souvenir. 11am seems like an unusual time for the marble to fall from the astronomical clock, but it is based on the history of Brno. Back in 1645 Brno was under siege by the Swedish army. They were holding out quite well, and winter was coming. A spy in the Swedish camp overheard the General say that there would be one last almighty effort to get into Brno, but if they hadn’t breached the walls by the time the Cathedral bells rang at 12 noon they would pack up and go home. During the battle, things weren’t looking so good for the Brno forces, so they came up with the plan to ring the bells at 11am. The Swedes thought it was noon, and packed up and went home! To this day the main tolling of the bells of the Cathedral of St Peter and Paul is at 11am. 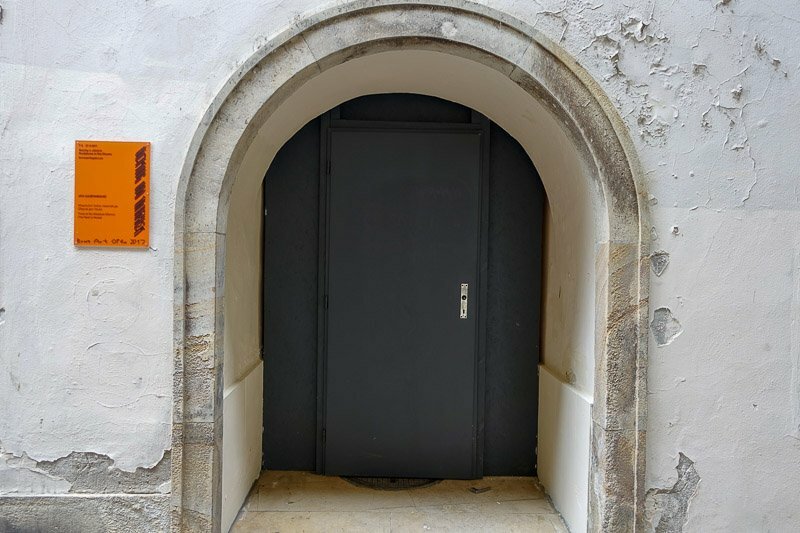 As you wander the streets of Brno keep an eye out for some unusual artwork. 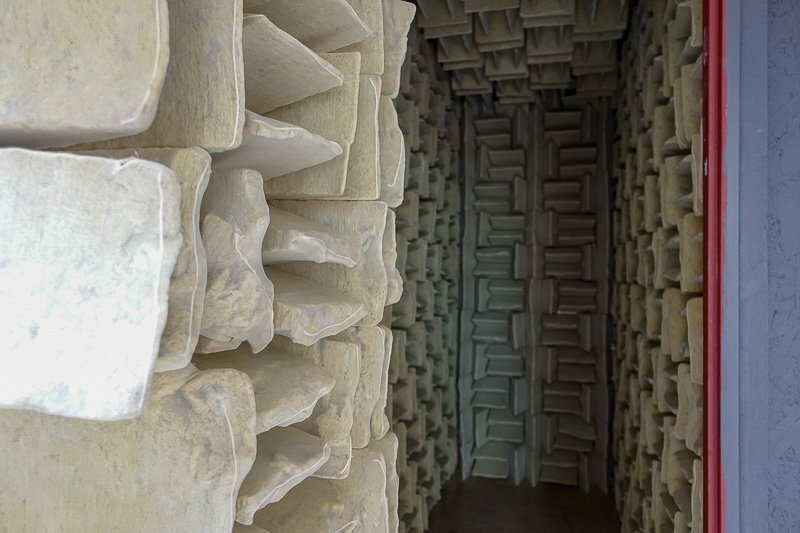 Behind a door is an art installation that doubles as a soundproof room. 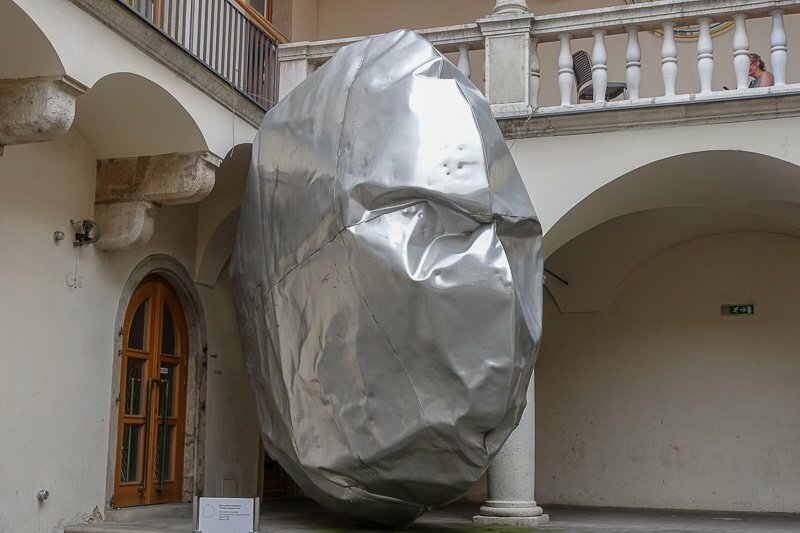 There is also a big silver balloon-like structure, that Simon affectionally dubbed the “Goon Bag” (a colloquial Australian term). Around every corner there is something else to surprise. It does look like a goon bag doesn’t it? 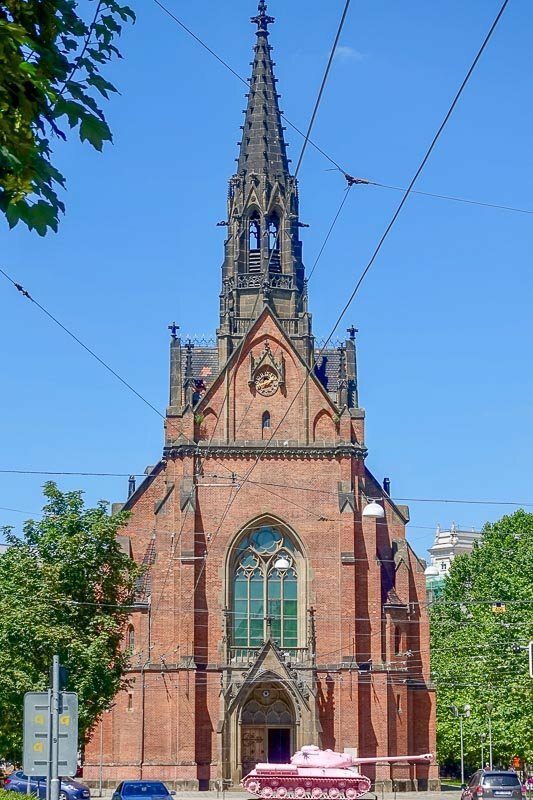 The Red Church is one of the few Protestant churches in the city. It sits prominently at the end of a long street. As we walked towards it, a pink tinge in the front took shape. Another art installation! The Pink Tank is an actual Soviet tank painted pink by David Černy in 1991 and is on display in Brno for a short time. 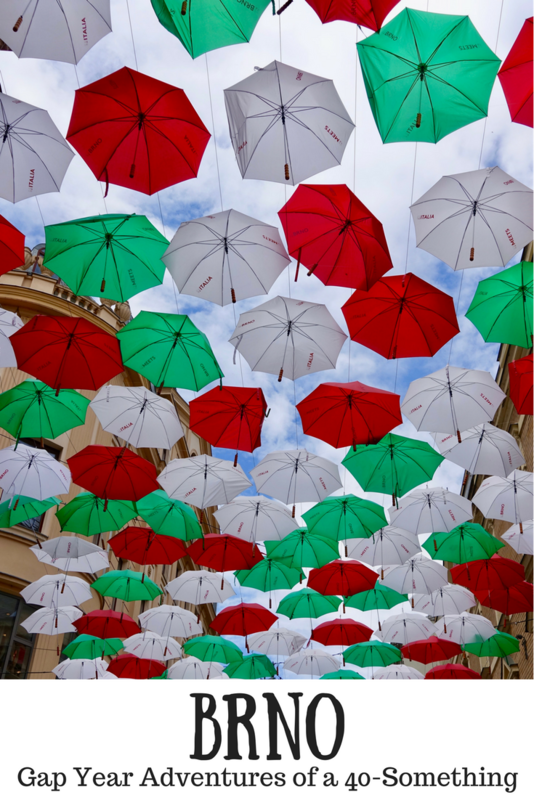 It is to commemorate the liberation of Prague at the end of WWII. The Red Church with the Pink Tank in front of it. Like almost every city we have visited in Europe, Brno has a castle on the top of a hill. We took an early morning walk up the steep zig zag paths from the side of Špilberk Castle. The castle houses a museum and art gallery, and it is possible to do various tours to different areas of the castle. 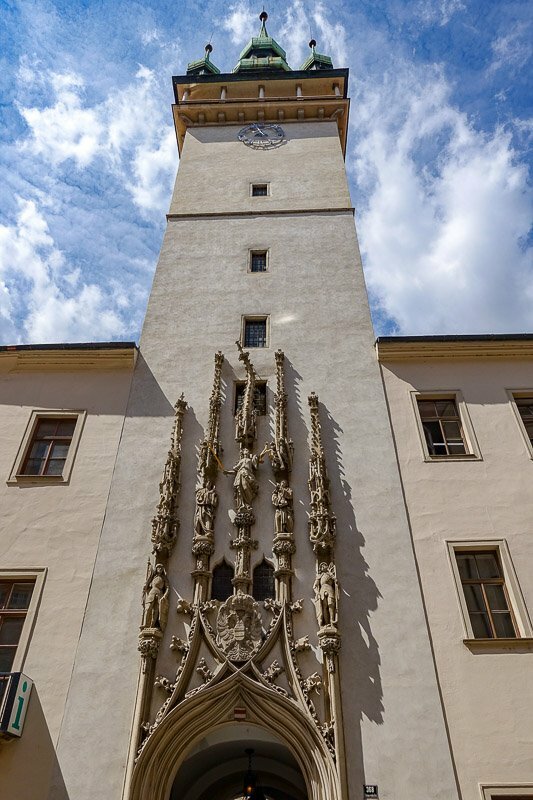 There are some permanent exhibitions showcasing the history of Brno, and temporary exhibitions also use the castle. For the different hours, tours and exhibitions, please see the website here. Brno is also home to the second largest ossuary in Europe. It was only discovered in 2001 and is home to some 50000 skeletons. Most of the bones were put here in the seventeenth and eighteenth centuries when there was a lack of space in the cemeteries due to the unusually high number of deaths from the plague and cholera outbreaks. While not close to the scale of Paris, it is worth a quick peek. Another underground area of Brno worth exploring is the Labyrinth under the main market square. The tunnels here started as cellars to store the fresh produce sold at the markets. As the owners got more and more produce, they needed more space to keep it all. They extended their cellars until they eventually joined up with each other under the square. The tunnels now show how the goods were stored, and also have some displays that show the instruments of torture used when the square above was used for executions and other punishments. There is also a part of the cellars that was set up as a tavern, again set up to show how it would have been. Ladies, as you leave, make sure you rub the special stone for luck! 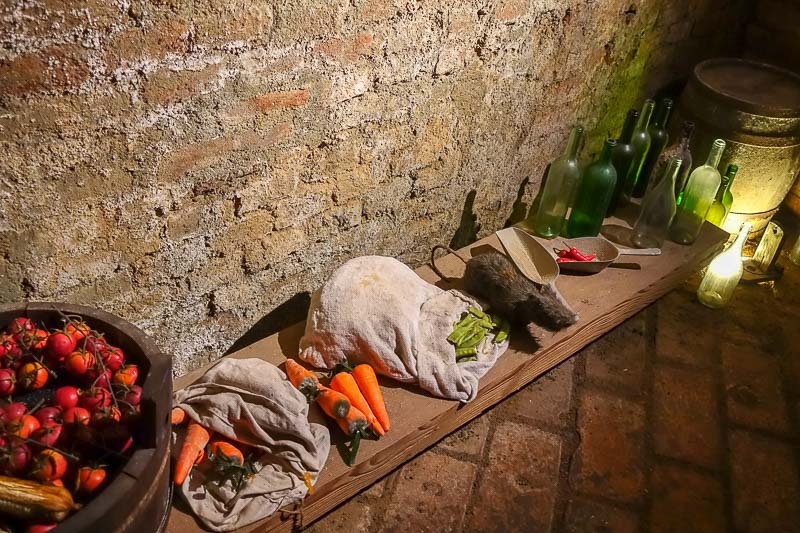 How food was stored – rat included! Brno market square. Fresh produce has been sold in this square for hundreds of years. In my research I had come across Villa Tugendhat. This house is architecturally important as is is known as the first example of modern architecture and is listed by UNESCO. What I didn’t discover during my research was that if you would like to visit you need to book months in advance, as it is usually sold out. The numbers of visitors is limited to only fifteen at a time. So if you would like to visit, plan this one in advance. Not far from the Holiday Inn there is a fantastic swimming pool. It is right next to the river and looks more like a resort pool than an Olympic pool. 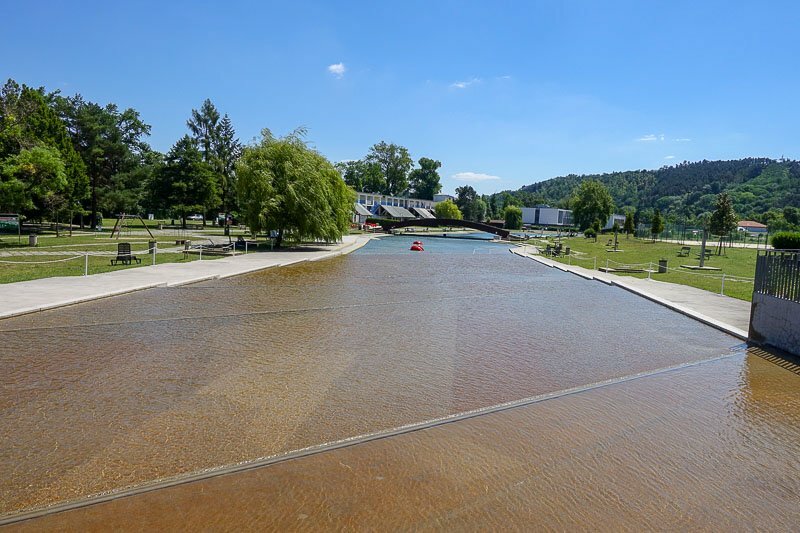 The pool is like another loop of the river, and is surrounded by grassy banks with loungers for relaxing in the sun. We quickly visited to have a look, but unfortunately did not get back to swim. If you are there during summer, it is the perfect spot to cool down. Looking down the artificial river towards the deeper pool area. This shallow area is great for smaller kids. A visit to the Czech Republic is not complete without beer! Or at least so I am told. I am not a beer drinker. No matter how many times I try it, I just do not like it. Luckily I have Simon with me to test out all the local brews. Here in Brno there are lots of little places that make their own beers, but the big name in town in Starobrno. The Starobrno Brewery is located walking distance from the centre of town and if you are near it you cannot miss the smell. It is possible to tour the brewery, then grab a meal and beer at the restaurant afterwards. We ate at wherever we happened to be at lunch or dinner time. 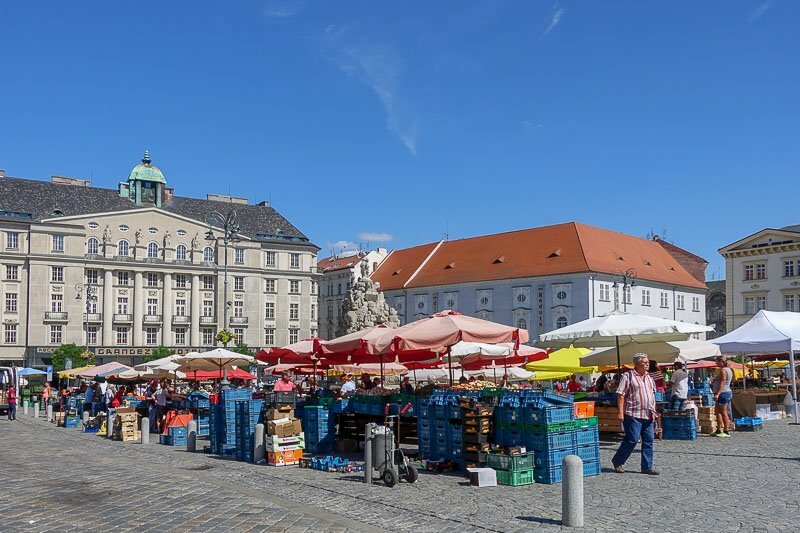 Brno has not yet fallen victim to “tourist prices” and all restaurants and cafes are reasonably priced to cater for locals as well as visitors. We nearly everywhere had either a separate English menu if asked for, or had a translation on their main menu. The best meal we had – in fact close to the best meal for our whole trip so far – was at Prominent Restaurant, part of the Holiday Inn where we were staying. It was absolutely delicious. Our full review is here. 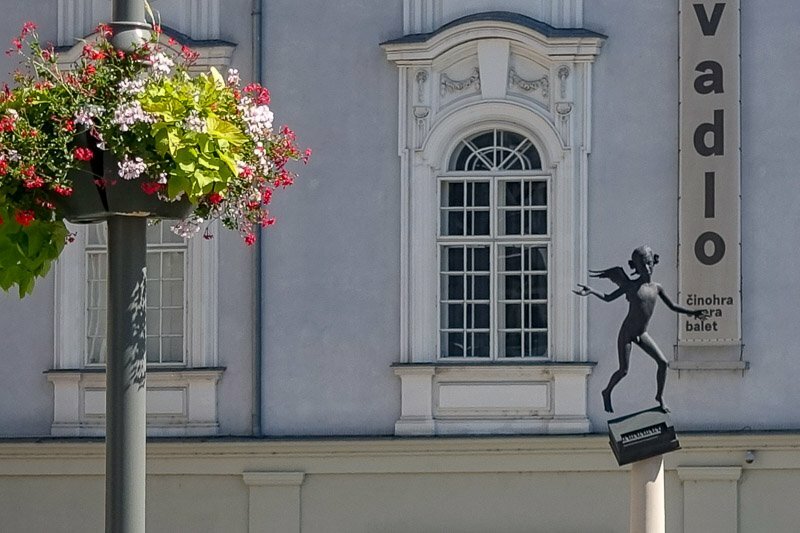 Mozart played in Brno when he was eleven. To signify this his statue has an 11-year old body with his famous older head! 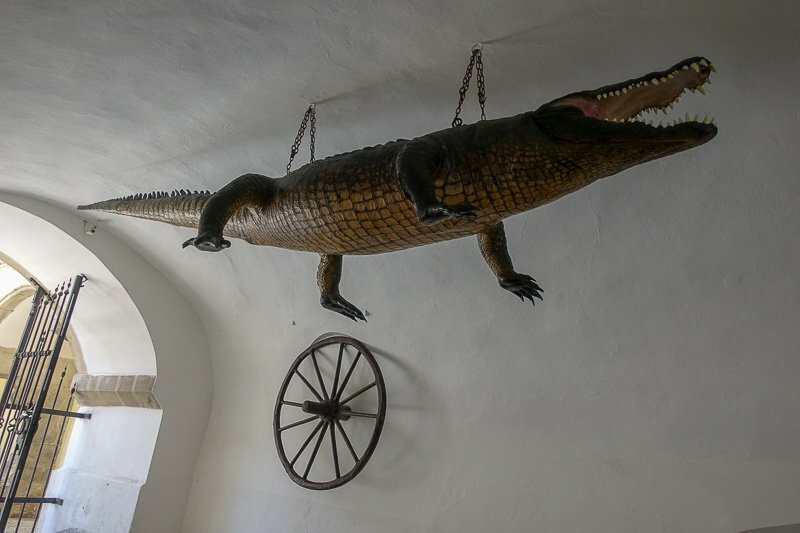 Why is there a crocodile hanging from a ceiling in Brno? I need to leave some mystery for you! Brno is a relaxed city. While we were there the weather was warm, and we enjoyed sitting around in the squares with a cooling drink just soaking up the atmosphere. Everywhere we looked there was something new and quirky. We are very glad we stopped by on our way to Prague. 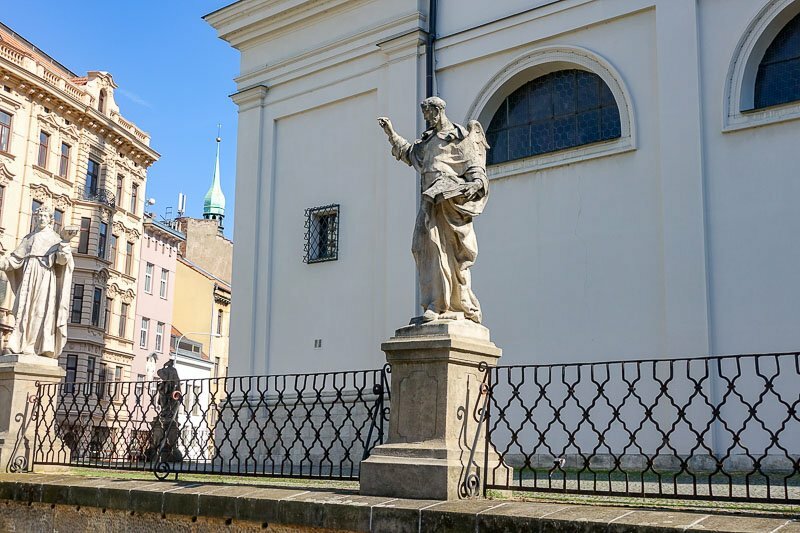 Brno is a great city for the budget traveller as you will get plenty of bang for your buck here. A beer (0.5L) is from €1, a decent main course at a restaurant from about €5, a cappuccino is around €2. Of course there are more expensive options available too. Every cafe and restaurant we ate at had wifi. We didn’t need it much while we were out and about though, and Brno is a small city that is easy to navigate and find things. We really only caught local buses to and from the train station. Tickets are not available on the buses, they need to be bought in advance. A single trip ticket was 25CZK (€0.95). We were able to get tickets from the train station and the Holiday Inn, but they are widely available at news stands all over the city. While we didn’t test it out to be sure, I did read that tickets are available to purchase on the trams. Thanks Carol. Definitely a lot of interesting things to see in a city many haven’t heard of. Wow! Brno looks so pretty. I love the way you have woven all the little tales from the past into your post. It gives it so much more flavor and makes the place more real. Then again it may just be me… I love history! 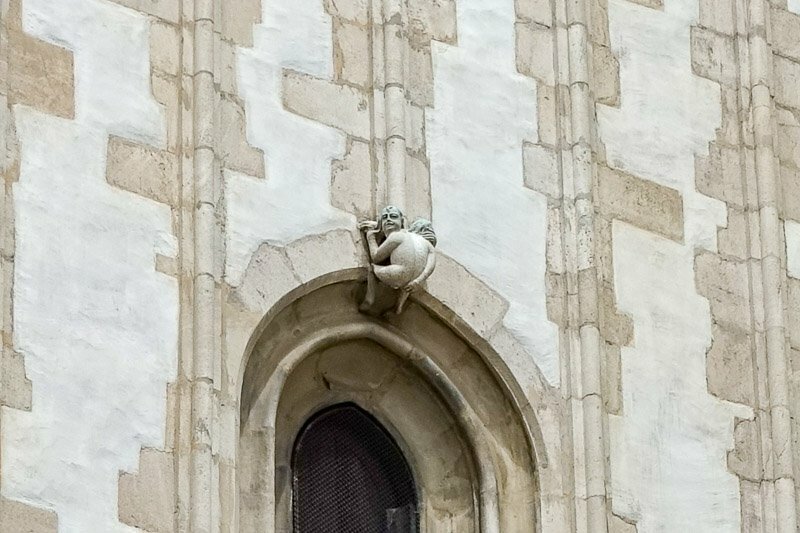 I really enjoyed your post about Brno, it is one of my most favourite city in the Czech Republic. After reading this I am craving to visit it again asap 🙂 I love its relaxing and easygoing vibe! Thanks Lenka. It was so much fun to visit. Wow what a lovely historical place! What a delightfully quirky guide. I love how long you spend describing these hilarious statues – they would be my favourite part too! Whatever happens to those marbles though? Do tourists take them home?! Is there an unlimited supply?! I am desperate to find out haha. Thanks Elise! Yes, if you catch the marble, you get to take it home. The guy on the left in my photo got it and we all crowded around to have a look. It really is just a clear marble with a bit of red in it, just like the marbles kids played with back in the day. So nothing special, just a good tale to tell. I’m guessing it’s therefore easy for them to get more to keep doing it. I really like all of the street art throughout the city. Having travelled in Australia for two years, the goon bag made me chuckle! I desperately need to add the Czech Republic to my list! Haha, good to hear someone understands what I mean by goon bag. Thanks Meg. Brno looks so beautiful and less crowded which I love! I can’t wait to visit! Thanks NieNie. It’s just starting to get touristy, so now is a good time to visit. I have only been to Prague in the Czech Republic. I would love to see more cities like Brno so I have pinned for future reference. Thanks Anisa. Brno is very different to Prague so definitely worth it’s own visit. Omg I got chills when you said 50000 skeletons! So much history and stories to tell! Yes! It’s almost an unimaginable amount of bones! Wow! This looks like such a cool place! I like that you have a eye for picking up on the unusual and interesting things about a place, I have the same eye! lol The person buried in the wall thing, that’s so strange, I love it! And I love the coffee cart! Great post all around! Thank you 🙂 It was easy to pick out the weird and wonderful in Brno, it’s everywhere! Thanks Amanda. I hope you get a chance to visit soon. I’ve visited Bohemia quite often and am very interested to visit Brno and Moravia as well. Thanks for sharing your experiences. I hope I will make it to Brno soon. Thanks Ricarda. I am sure you will enjoy visiting Brno. 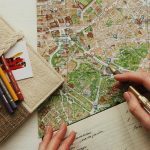 I learnt so much from this article on Brno! I loved all the quirky things, especially in the statues. I’ve visited Prague before and wasn’t the biggest fan so maybe I’ll need to go back and visit Brno instead. Also, being from NZ, I appreciated the goon sack comment hahah! Glad you understood 🙂 Brno is very different to Prague, so hopefully you’ll like it. I’m always keen to learn about new places to visit and I’d not heard of Brno before. Your post has inspired me to take a trip there, it looks really interesting and I’m sure my boyfriend will enjoy the €1 beer! Haha, yes, the cheap beer for the people who like it is definitely a bonus! I love your pics and all the public art. We’ll have to add this to our list to visit! Thanks Eleonore! It just means you will have to go back to the Czech Republic again for another visit. 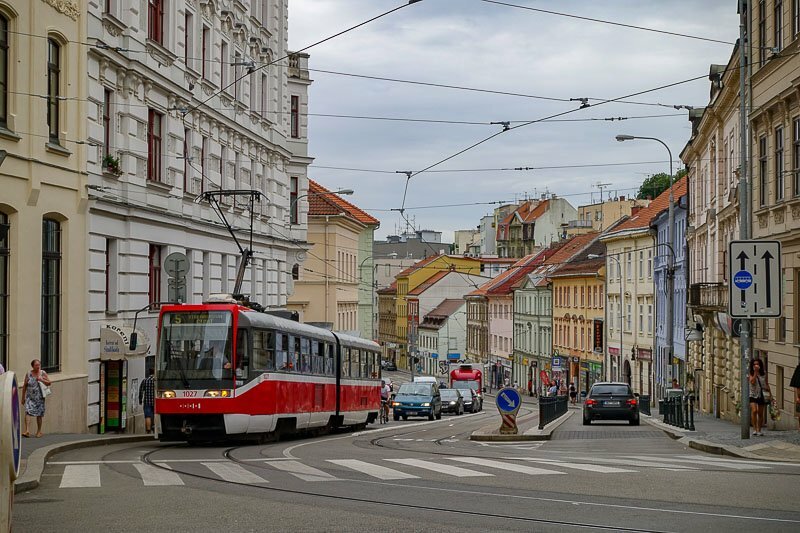 Brno looks absolutely wonderful! 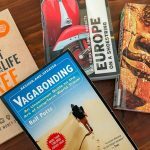 I’d never heard of it before your post and now I’m adding it to my list 🙂 Great post Josie! Thanks Sierra. Glad to hear I’m not the only one who had never heard of it before! Brno looks exactly like a city I would LOVE to visit. So much to see and do without being overwhelming and a fascinating history. Thanks Alex! I think you have summed it up perfectly! Looks like a really great place. I need to spend more time in Czechia. I have only been to Prague. The astronomical clock looks super cool! I was so tempted to try to get a marble, but I wasn’t sure who early I would need to be there. The thought of waiting for hours was a little off putting. 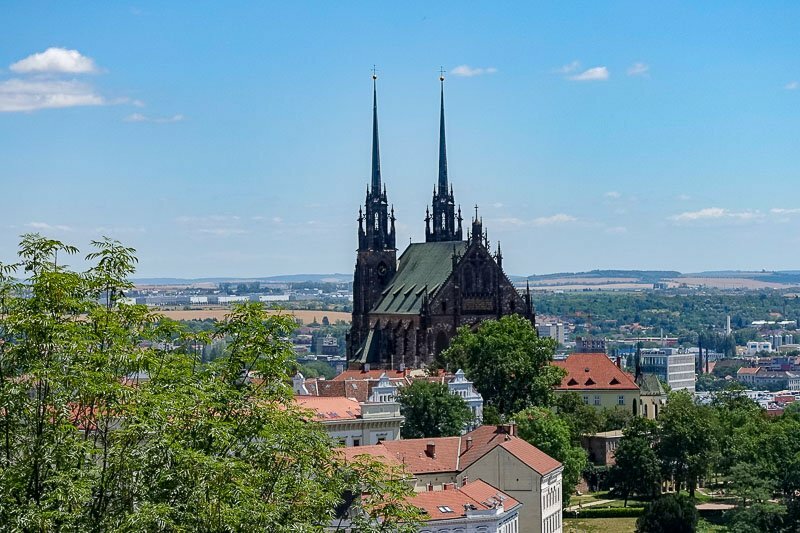 Had no idea about Brno before this post! The story about the 11am bell ringing is funny. Yikes with all the skeletons… I couldn’t even stomach going to kutna hora. Cemeteries, crypts, and skeletons are too creepy for me. We went to the Catacombs in Paris a few months ago. Compared to that, this is tiny! I’ve heard so many good things about Brno and it really does look like a cool place to visit. 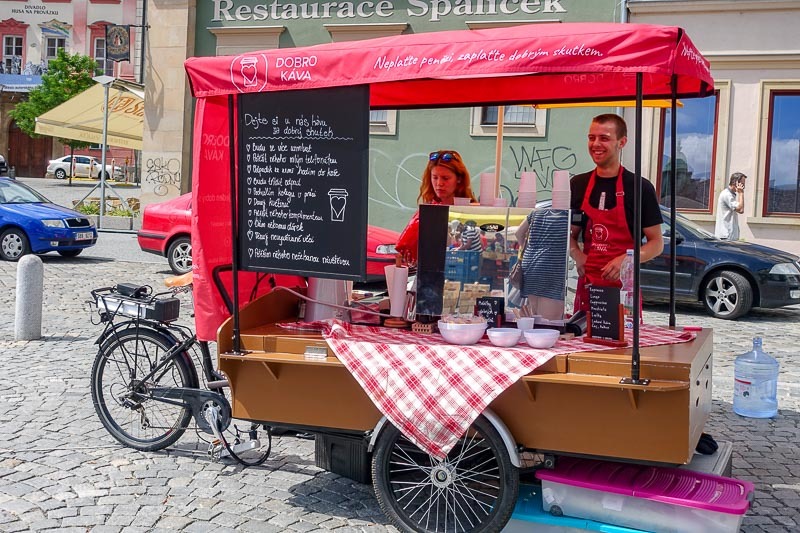 I’ll definitely be adding this to my list for the next time we are in the Czech Republic! Thanks Kelly. I’m sure you won’t regret it. What a fascinating place! You had me at quirky, and you weren’t wrong. Definitely on my list of places to go now. Thanks Bernadette. I hope you enjoy it as much as I did. Wow this looks like such a charming city! I hope I can go one day. 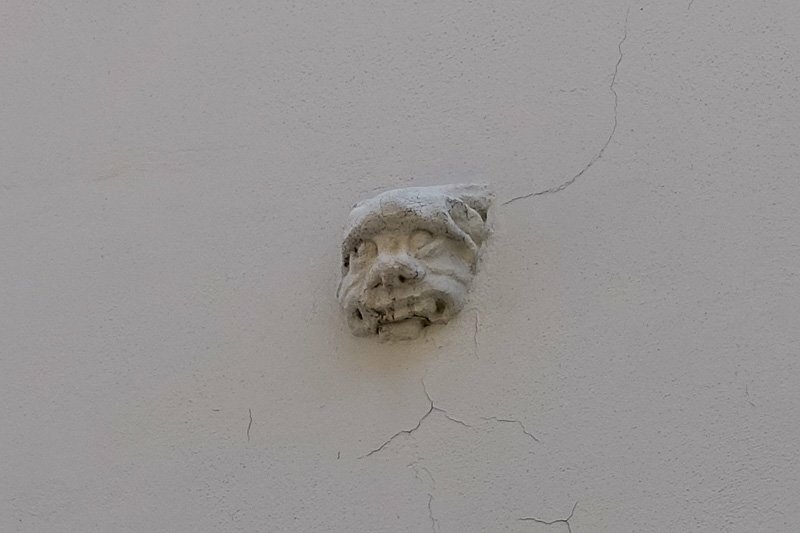 Also that face in the wall!?!?! So creepy!!! Oh, Prague and Brno are definitely different. I liked both, but they are hard to compare. There is surely some cooky ART here and I’m liking how laid back it looks. The cathedrals would be very lovely to explore, I imagine the walls have some history. We only spent a few hours there and only saw the square, the church and the catacombs. Need to go back and spend more time! I love all of the neat trivia! I’m going to have to make a trip here with the trivia so I can remember in case I go. 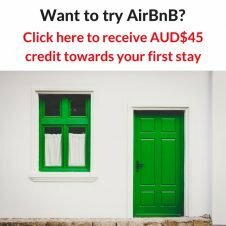 It’s that kind of place – Lote of quirky information! LOL at the door and what you found behind it! This seems like such a fun and friendly place to be! Hahaha, yes, the door “artwork” was a bit strange. I am not an “arty” person, and I am always puzzled by things like this. I am sure there are many other people that find value in it though. Love it when I find out about a new city I can tell I will love. I was blown away by Prague I’m going to definitely check out Brno next time! I hope you enjoy it! It’s very different to Prague, but still worthy of a visit. 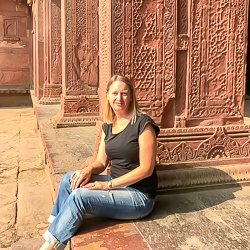 Josie – lovely to start reading your travel Blog, albeit a little late. I just chose this blog at random as I’d never heard of Brno before, but funny thing I met a friend for lunch today who just came back from Europe and had made a special trip to Brno to visit Vila Tugendhat (http://www.tugendhat.eu/en/)-is an architecturally designed house built in 1929 for a young couple and it was commandeered by Nazis during the war. Simon Mawer’s novel “The Glass Room” is a fictional account of a house inspired by the villa, set in Brno and my friend loved the book so was determined to visit Brno and the villa. Unfortunately you have to book about 2-3 months in advance but my friend was lucky and managed a ticket through a cancellation at the last minute! She said it was worth the trip! How serendipitous is that? Two descriptions of Brno in one day. Many useful tips there, thanks for sharing! 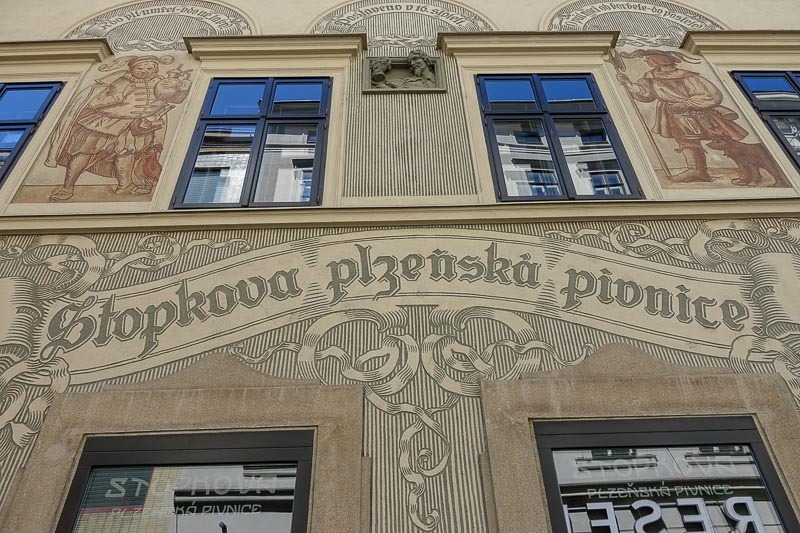 Indeed, from the Gothic architecture in Prague which brings you back 500 years, castles and mansions that are awe-inspiring and an up and rising food scene and the best beer in the world, Czech Republic has much to offer to everyone. 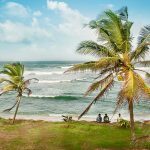 However, in this beautiful land also lie tourist-targeting scammers and petty crime. 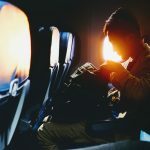 Do be wary of the trilero street scam, drink spiking, longhauling taxi, public transport pickpockets, shortchanging, street money exchange scam and many more! Thanks for the tips David. While there are definitely scammers everywhere, I felt Brno was safer than many places in Europe.